Pope Francis has urged European Catholics to take in some of the thousands of migrants streaming in from Syria and other countries amid the world’s largest refugee crisis on record, and in his address to Congress today he urged leaders to welcome and respect immigrants coming to the U.S. But just how closely public opinion aligns with the pope’s more benevolent attitude toward immigrants varies greatly. Germans, the British and Americans hold the most positive views of immigrants, while Greeks and Italians hold the most negative views, according to surveys conducted by Pew Research Center in the U.S. and seven European nations. The United States is home to world’s largest immigrant population (41 million), and is by far the largest economy of any nation surveyed, but views of immigrants are mixed. Half (51%) of Americans this year said immigrants make the U.S. stronger because of their hard work and talents. Meanwhile, 41% said immigrants are a burden because they take jobs, housing and health care. American attitudes toward immigrants are more positive today than they were in 1994, when just 31% of Americans said they’re a strength and twice as many – 63% – called immigrants a burden. Germany is Europe’s economic engine and its most populous nation. It is also home to 6 million immigrants born outside of the EU, the most of any EU country. Attitudes toward immigrants are even more positive there than in the U.S. In 2014, two-thirds (66%) of Germans said immigrants are a strength because of their hard work and talents, while just 29% said immigrants are a burden because they take jobs and social benefits. However, among the European countries surveyed in 2014, Germans had among the most negative views of immigrants when it comes to crime, with about half (48%) of Germans saying immigrants make crime worse in their country. In addition, Germans were among the most likely to say immigrants are failing to assimilate: About six-in-ten Germans (59%) said immigrants today want to be distinct from German society. In the United Kingdom, by contrast, views toward immigrants are more uniformly positive. The U.K. is also home to a significant number of immigrants born outside of the EU (5.2 million). 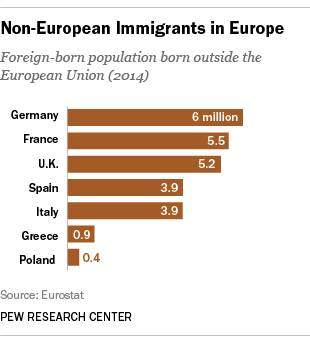 About half (52%) said immigrants are a strength, a share that trailed only Germany. At the same time, just 20% in the U.K. said immigrants are more to blame for crime than other groups, among the lowest shares in Europe. On assimilation, about half (47%) said immigrants today want to be distinct from U.K. society. People in Greece and Italy have among the most negative views toward immigrants of the European countries surveyed. Besides the fact that both nations’ economies have struggled since the recession, they both felt the impact of the first waves of African and Middle Eastern migrants. In both countries, about seven-in-ten said immigrants are a burden. The nations also have some of the most negative views of immigrants on crime, with about half in Greece (51%) and Italy (45%) saying immigrants are more to blame for crime than other groups. But attitudes toward immigrants in Italy and Greece diverge on assimilation, with 77% of Italians saying immigrants want to be distinct from Italian society, by far the highest share of the European countries surveyed. By contrast, 48% of Greeks said immigrants want to be distinct from Greek society.